DLC poll Pick 5 choices for 5 characters. Crash Bandicoot "Smashes his way in!" Coco Bandicoot (As seperate DLC bundle from the 5) "Kicks and Spins"
Minecraft Player (Steeve is the only skin with 2 outfits) "Digs into DLC!" Diamond Armor as Mii Swordfighter outfit. Ms. Pacman "Is a Packaged deal!" Tetra (Zelda Windwaker) for the first time ever, 3 Zeldas unite! This poll will close: Sep 25, 2019 . You can vote up to 10 results, so please, I know most of you will only vote for one, but please remember I'm trying to find the top 5 characters. So, if your selection is "other" please list the character in the comments below. Also, please list a stage idea for the character below and your reason why voting if you want to. It seems I made a mistake, well you can still Change your vote after selecting "other" so it doesn't matter so much. Also, Steeve is supposed to be 2 or more of Minecraft Player's Skins in the poll, one Alex skin, and other skins from other Minecraft stuff such as Master Chief, Minecraft Story Mode, and other Minecraft Skin collections just to clarify. Dixie Kong was added to the poll! While we're on the subject, Funky Kong is will probably be his own character, with some special moves cloned from Diddy Kong, such as Banana Gun peel throw, Barrel Jetpack, and some strength attacks copied from Donkey Kong such as Headbutt,. And Donkey Kong's older Final Smash. Dixie Kong would be an echo of Diddy Kong similar to Ganondorf with some of her attacks being A button, and one attack allowing her to glide with her ponytail. Blaze the Cat would not be an echo of Sonic... She would have a variety of Fire based moves and a button attacks to be different. Shadow would also have Smash attacks like Gannondorf's sword wielding smash attacks. In comparison to Sonic, as well as be floatier but harder to knockback due to his antigrav-magnet-rail shoes. These polls are only able to influence a second wave of DLC or characters in the next game, keep in mind that fans read this, Nintendo employees read this, and so do 3rd parties. Though there are no guarantees your results may be heard, someone will take notice. Okay, but Impa would probably be an echo of Sheik, I'll consider Impa for my next poll. But whatever, there's also a version of Impa that uses a giant sword, so. As for Doom Guy... I'll have to see if Doom was ever released on a Nintendo console. Impa or Doom Fighter that's what I'm calling the guy, or Doom Marine. Which do want me to add to the poll, Impa or Doom Guy? It's Microsoft's contract deals I'm worried about. It'd be more difficult than getting Banjo in Smash. Can we add Suezo to the poll? Um... only if another person here can tell me who that is... Without looking the character up online. The character must have appeared once on a Nintendo Console. They cannot be a Disney, Detective Comics, Nickelodeon, Cartoon Network, MTV, Jump Manga, or Marvel Character. No they cannot be a legendary character like Robin Hood. They Cannot Be Zeus Kratos, or Medussa, They cannot be King Arthur, They cannot be Doctor What? and they cannot absolutely not be the Anime version of Ash Ketchum. I'll just leave my choices as text I guess. I'll add Geno on there, but honestly, when it comes to Mach Rider, I think she has a better chance of being two of Mii Excitebiker's alternate outfits, along with a Warioware outfit, and an Excitebike outfit, and some of the Mario Kart 8 Mii outfits. You'd have to convince me you're not just creating artificial demand based on a false leak, like Sora for Kingdom Hearts was during the April Fool's prank. Sora Fans really either wanted Cloud in Smash, or Mickey Mouse... And only one of those was Nintendo able to select. I only voted for Impa. None of the other characters on your list would even make my top 100. You make me question what the other top 100 characters are... likely has Son Goku on the list. Also need to let you know I think Mach Rider could easily have cloned moves from Captain Falcon, Wii Fit Trainer, ZZS, and Wario. likely has Son Goku on the list. I didn't insult you. There's no reason to insult me. You have Matthew and "other" listed twice in the poll. Also, you should add Lycanroc, Vaati, Mii Wizard, Lip, and Shantae to the poll. However I would allow Mii Magician into the ranks, with Top Hat and Magic Wand, Wizard Hat in other outfits. Top Hat will conjure from nowhere in outfits without a hat. And no, I don't think Lycanroc can get in without fans complaining that their favorite version of Lycanroc isn't in the game. Vaati is a no... We have Ganondorf… Shantae... If I can get enough people who've actually played her game, then I'll put her on the ballot. I would need an admin to remove (other) from the poll. I'm not saying "other" and Matthew should be removed, I'm saying they shouldn't be in the poll twice. What the heck... I didn't know Mathew is in there twice! I'll ask an admin to remove it asap! If you vote more than 12 I would prefer you check all your favorite Mii Fighters in addition to your other votes. Just don't vote the maximum if your final votes end in a multiple way tie. Close to a mailbox, Eddy. Just curious, don't several of these threads already exist? Go ahead and vote for Chun Li if you want. I like the character. Yes, but I kindof planned to do this... er correctly.... so to speak, include as many characters as possible and give everyone multiple votes. As for ranking your characters, I think that's a great option to help with tiebreakers. I will also link the poll results directly to Nintendo's feedback center. This website actually is one of the few 3rd party websites Nintendo pays attention to... (Sometimes) I mean for proof, just look at Simon Belmont's character support thread. Granted this may be an example of 3rd parties keeping an eye on this information. But recognize that a 3rd party may also see the support threads here. I'm actually hoping that Microsoft decides to make Banjo-Kazooie, Mumbo Jumbo, Steeve and Alex characters on Brawlout as a special DLC Package. Then I hope Shonen Jump goes on the train and has Goku. and Naruto. If Activision Misses Ultimate DLC I'm hoping Crash, Coco, Crunch and Dr. Neo Cortex in a Bandicoot DLC bundle. Then Spyro, Cynder, Hunter, and Stealth Elf. In a Spyro Bundle. The top three I support in my signature, so they're pretty obvious. Geno and Banjo Kazooie have a lot of personal meaning for me, Bandanna Dee just seems cool enough and his community deserves the chance to have him playable more than my personal attachment. Dixie Kong is the biggest character missing in Smash from Nintendo at this point (Alongside Toad), so she definitely deserves the spot and I'd love a move set based upon her hair. Rayman is probably my most wanted traditional third party (Banjo and Geno are weird due to various reasons) on this list. He needs the work cause Ubisoft doesn't seem interested in using him beyond another Legends port... Plus he's just kind of cool and would fit well in the game. Also, just get rid of that Sukapon Echo junk on him, that doesn't make sense beyond them sharing detached limbs and he's already out. I went to pick Ryu Hayabusa but he wasn't listed. The Fatal Frame assist trophy may have been a wink or head nod to the possibility of more Koei Tecmo involvement in Smash. Fatal Frame is co-owned by KT and Nintendo. "Tetra (Zelda Windwaker) for the first time ever, 3 Zeldas unite!" But, mate, there are 4 Zeldas in Hyrule Warriors. Geno has 35.3% of the votes... I've lost all faith in the community. Also, for my Other vote, I'm going Hector. I always love finding fellow Ryu Hayabusa supporters. When I think of classic NES trilogies and games, Ninja Gaiden has to be the largest IP (Outside of Dragon Quest in Japan I suppose) from that time that isn't represented. And it feels particularly strange considering Koei Techmo has a good relationship with Nintendo, he has crossed over before with Dead or Alive, and he could have a really cool move set. Take my Like good sir. Seriously? People vote for characters they like, and people like Geno. 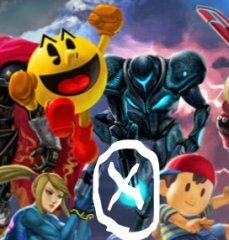 After Piranha Plant I don't think anybody has a leg to stand on of what can or can't be in Smash outside of non video game characters at this point. Oh I did. I voted for everyone listed, they're just categorized by level of personal desire. I must admit, though, It'd be cool to have Chun-Li go at it with Samus & Peach. Ohhhhh, OK. Man, its really unfortunate how no one in the Smash team.....actually, scratch that, no one at Bandai Namco thought to include her. She's as much of an obvious/perfect echo candidate as Ken, IMO. There was arguably even a good little spot for her right beside Pac-Man in that huge roster mural. And as previously stated, a match between Ms. Pac-Man, Chun-Li, Peach & Samus would be about as epic as Mr. Pac-Man vs. Mario, Sonic & Mega Man was last game. ....Sorry for the rambling there. It's just such a missed opportunity to me on a personal level. Wow that's weird. After Banjo my favorites are at the top so far. That means nothing but feels nice.